Ahh! Summertime is here. More and more of my clients are finding time for a little trip to Florida during peak catching season. They have discovered June, July, and August can be hot, muggy and buggy, but some of the BEST FISHING of the year. 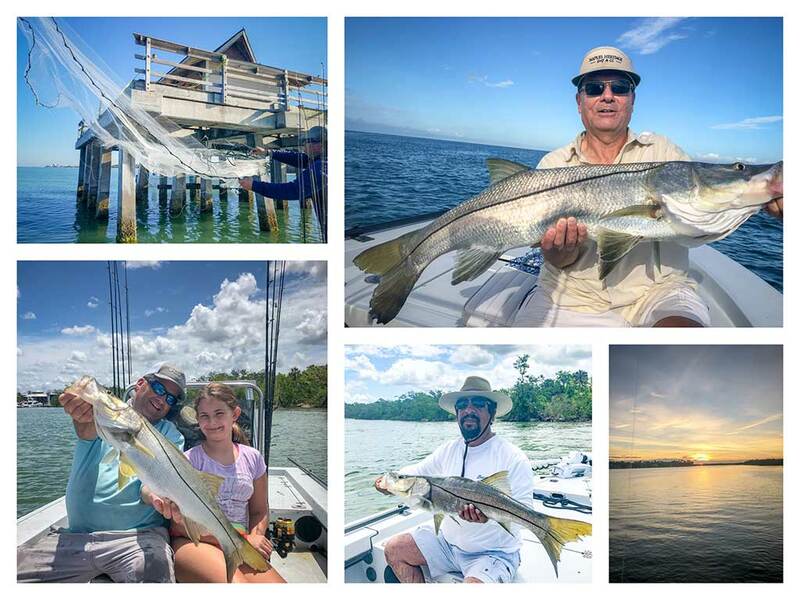 These first couple of weeks of June have been outstanding for Snook, Tarpon and Sea Trout. Loads of small snook with waves of bigger ones have been thick through the middle bays to the outside points. Live pilchards are like candy to these hungry snook on the incoming tides. DOA shrimp on hard bottom, or under a cork if there is grass, works great. Simple Clouser Minnow and Everglades Special flies have been great along the beaches when it is calm, and dark Muddler flies are working well inside the passes. Spawning fish have been sporadic at best, but are hungry all the same. Please treat these fish with care when releasing, as they are an important component of our future fishery. Tarpon schools slid by our area faster than usual this May during the mullet run. However, plenty of these fish seemed to have stuck around for June and hopefully for the entire summer. They will hit a live crab when dropped in front of their noses from early morning to mid-day, as long as tide is incoming. Large pilchards and live mullet work best on the out going tide in and around the passes during the evening hours. Marco Island to Estero Bay will have traveling Tarpon working schools of bait. You'' see the baitfish fly out of the water when then tarps are feeding. This is a great way for me to spot a school of feeding Tarpon while on a fishing charter with my clients. It's hard not to concentrate on the snook and Tarpon this time of year, but some people enjoy eating fish as much as they like to catch them. Trout and Pompano are two great options for fish we love to eat. Two early Tarpon trips this month were spent inland because of wind. Both of my clients had fished with me over 15 years, mostly in the winter when we target trout. Both trips turned out to be some of the best trout catching either had seen. These fish hit live bait, both shrimp and pilchards, as well as tipped jigs just like I use all winter. Go figure!. The pompano seem to be enjoying the warm water temps as well. I spent several mornings catching larger that normal fish in the passes. From June through September you can expect good to great action on most trips, and great fishing adventures!! Reserve your fishing charter today! Every day on water brings something new to experience. The other day we were riding down the Intercostal Waterway along Keewaydin Island down by Hurricane pass. 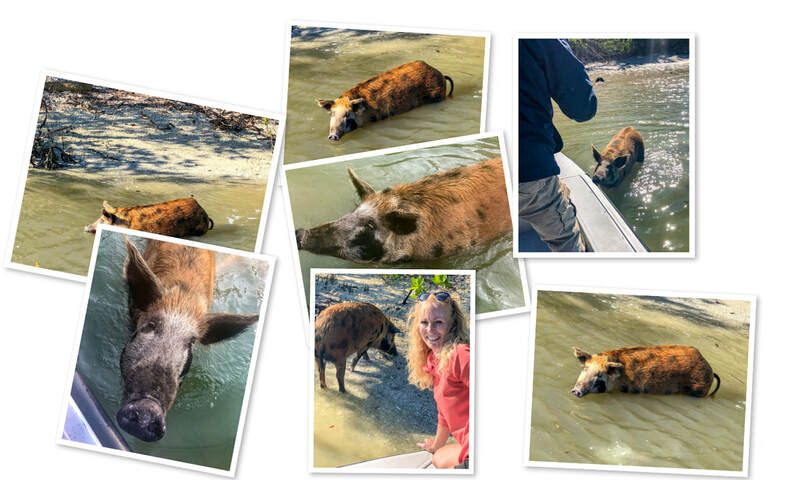 I had mentioned to my clients earlier that ferrel pigs used to inhabit the barrier islands in the area, but are seldom, if ever, seen anymore. That's when this big guy just comes walking out of the mangroves, and walks right up to my boat with little to no fear, just hunger, LOL. He liked the leftover ham sandwich (I know... kinda messed up feeding a pig a ham sandwich), anyway, he didn’t seem to care. He posed for a few photos, and went happily off. I enjoy sharing stories and tips from days well spent, out on the water. Hope to have you on YOUR fishing adventure soon!